Dice-building comes to Middle-earth! 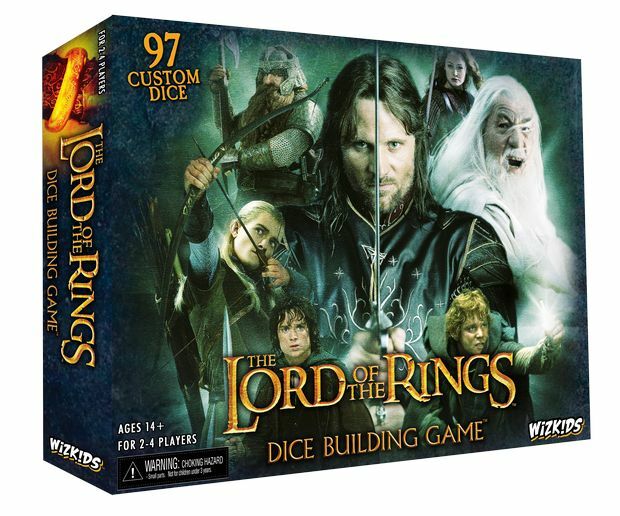 In The Lord of the Rings Dice Building Game, which uses the dice-building game engine from Quarriors, players lead an army of brave men, wise elves, battle-hardened dwarves, and even the short-statured but stout-hearted hobbits – represented by custom dice – to stand between Sauron and his armies of orcs, goblins, trolls and ringwraiths as they scour the land to find The One Ring. Gain glory for your people as you work together to defeat Sauron and save Middle-earth! 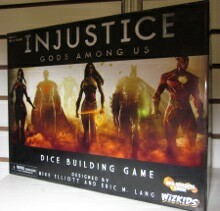 WizKids will release a dice building game based onInjustice: Gods Among Us later this year. Injustice: Gods Among Us, a fighting videogame using DC heroes, will launch in April for Xbox, PlayStation, and Wii U. TheInjustice dice-building game will use a different gameplay system from the Quarriors andLord of the Rings dice building games (see “‘Lord of the Rings Dice Building Game’“), but like those games it’s designed by Mike Elliott and Eric Lang. WizKids/NECA, LLC (WizKids), the leader in collectible gaming, is inviting gamers, collectors and Star Trek fans alike to recreate some of the most iconic battles in Star Trek lore. Today WizKids announces the latest board game title to join their Star Trek HeroClix™ miniatures game line-up, Star Trek: Attack Wing. It features collectible pre-painted Star Trek ships and the FlightPath™ maneuver system licensed from Fantasy Flight Games. 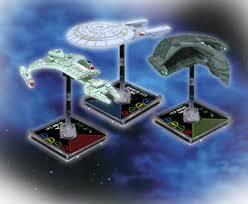 Under license by CBS Consumer Products, Star Trek: Attack Wing is expected to launch late summer at Gen Con Indy 2013. Players engage in exploration and combat, traversing sprawling Star Trek space maps made available via an in store Organized Play program. As commander, players have the ability to customize, upgrade, and assign famous crewmembers to their fleets, which feature ships from the series’ prominent empires and forces as well as special stats and abilities, and unique maneuvers on separate HeroClix Combat Dials™. 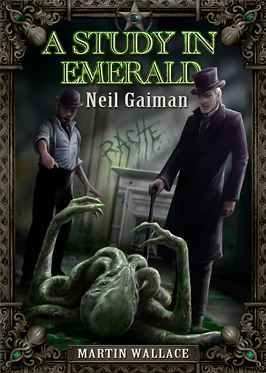 ‘A Study in Emerald’ is a board game inspired by the Neil Gaiman story of the same name. The premise is simple, the year is 1881 and the ‘Old Ones’ have been ruling the earth for over seven hundred years. Although most of humanity has accepted these monstrous rulers, there is a growing underground movement to overthrow the regime, labeled the Restorationists. A secret war is being fought around the cities of the Europe and the New World between agents of the Restorationists and those loyal to the powers that be. At the beginning of the game you are assigned a secret identity, which will either be that of a Restorationist or a Loyalist. Your identity matters as it determines what you need to do to achieve victory. There is a deck-building component to the game. You start with a deck of ten cards and you add to this set as the game goes on. There are twelve decks of cards on the board, one in each city. ‘A Study in Emerald’ is designed for two to five players and should take around two hours to play. 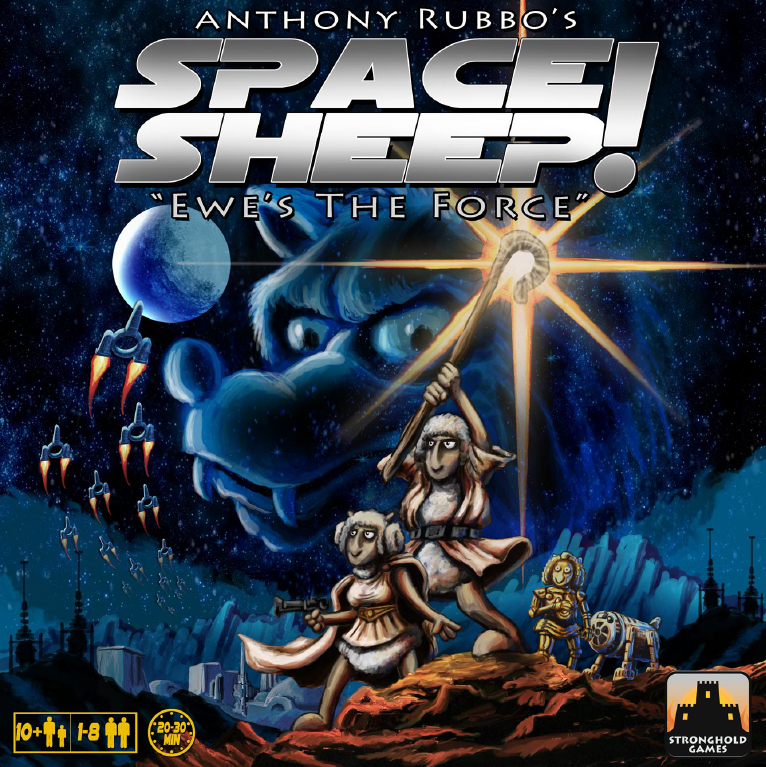 Stronghold Games is proud to announce “Space Sheep!”, a very unique game designed by Anthony Rubbo. Space Sheep! is a real-time, customizable, cooperative game with a possible traitor in the midst. For 1 to 8 players, Space Sheep! is extremely customizable, making each play experience different. Players choose the number of Systems in play (to change game complexity), the number of Tactics cards to use (changes game difficulty), the strength of the Wolf (changes game difficulty), from 0 to 3 Allegiance Cards to use (cooperation vs. competition), and the Direction Cards to use (creates variability in the game).